Who knew housing would crash in 2007? What's next? Applaud who you will for the exploding cost of housing from 2000 to 2007, and then blame the same folks for the disaster that followed said explosion. Unscrupulous bankers, brokers, government workers and agencies, and consumers all had a hand in the mess. 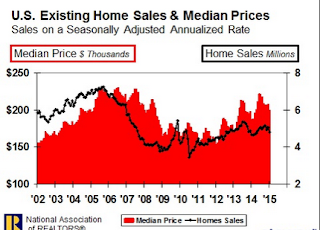 But none of the excesses would have been possible but for the BIG MYTH of that time: home prices will continue up forever. The truth about any market is that there is no permanent truth other than change. Whether gold, steal, copper, coffee, stocks, bonds, or real estate, you can count on the reality that at some point the amateurs and pros will both get blindsided. Over the next several weeks, this blog will make the case that Los Angeles, and to a great extent the rest of the US and World, is entering into a period where the most brilliant among us haven't a clue of what to expect. They might pound their chest with bravado about their scientific theories of what the future holds, but the ones who turn out to be right will have done so by blind, or at least almost blind, luck. Here is a short list of why the future is so unknowable regarding economic trends of any kind. Population growth in Los Angeles is coming from an aging population. People are living a lot longer. This trend is very likely to increase, not decrease. Young adults are getting married much later in life, if at all. We are not replacing the population through childbirth. Homes built in last 50 years were designed for a family of 5, not 3. A possible future where a majority work at home. A shrinking middle class, and increasing upper middle class. Not enough jobs for two wage earners in many homes. Possible shrinking population with no low wage jobs for immigrants. Self driving cars making commuting more bearable. Likely large increase in mortgage rates from historic lows today. Student loans keeping many out of the housing market. Cost of basic goods and services will continue to decrease, creating a rising % of income that will be available to compete for housing. The middle class moving out of Los Angeles, or even California, in search of cheaper housing and lower taxes in places like Texas or the Carolinas. If you'd like to do your own analysis. Go back through the list and see how many of these changes are likely to push prices up, and how many will be pushing prices down. Add your voice. What other major factors are likely to shape real estate prices in the future?